Hash Kracker is the free all-in-one tool to recover the hash password for multiple hash types. It supports following popular hash types such as MD5, SHA1, SHA256, SHA384, SHA512. Most online websites do not directly store the user account password, instead they convert it into one of hash types such as MD5, SHA1, SHA256 and then store it. Same approach is followed by some of the desktop applications. These are one way hash algorithms. That means you cannot decrypt the hash to get back your original password. 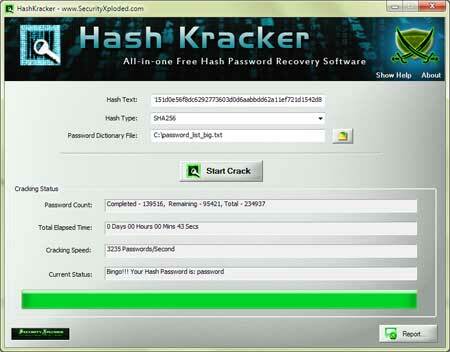 In such cases HashKracker can help you to recover your hash password. Hash Kracker uses Dictionary Crack method to keep it simple and easier. However you can use tools like Crunch, Cupp to generate brute-force based or any custom password list file and then feed it to Hash Kracker. Here are the main benefits of Hash Kracker, * Free universal tool to recover the Hash Password * Supports popular hash types such as MD5, SHA1, SHA256, SHA384, SHA512. * Automatically detects the Hash Type * Displays detailed statistics during Cracking operation * Easier and Quicker to use with cool interface. * Generate Hash Password Recovery report in HTML/XML/TEXT format. * Includes Installer for local Installation & Uninstallation. Hash Kracker is fully portable tool and works on wide range of platforms starting from Windows XP to Windows 8. Password Management tool with password generator. You can generate unique password for all accounts. Generate password with mix of uppercase and lower case characters, you can also include numeric and symbols when generating password. This site does not contain serial number, crack, keygen Hash Kracker serial number : serial number is the simplest type of crack. A serial number(cdkey,product key,etc) is register the program as you may already know. a crack or keygen may contain harmful software. If you cannot find the exact version you want, just give it a try. for more information read .nfo/.txt/.diz file include in zipped file.